The memory usage of of my extensions goes up tremendously as the computer is used. Individual or small groups (2-4) of extensions increase their memory usage, which can go as high as 200,000 KB. There is no pattern to this problem. 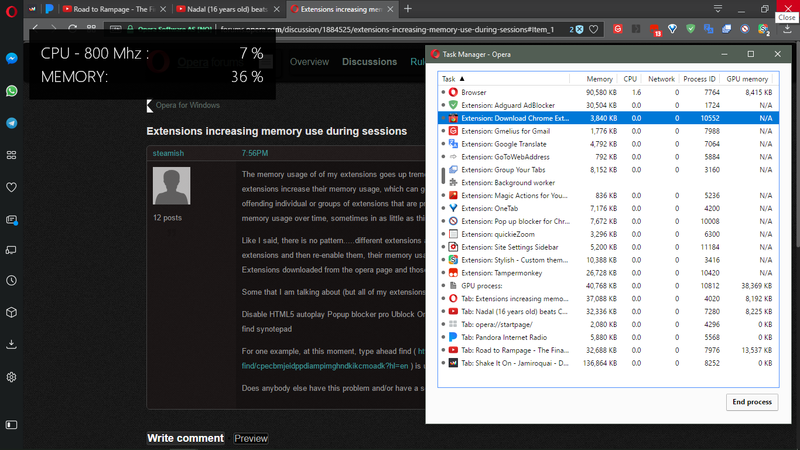 The offending individual or groups of extensions that are problematic start out with a normal memory usage, but continue to add memory usage over time, sometimes in as little as thirty minutes after starting. Like I said, there is no pattern.....different extensions and groups of extensions have this problem. If I disable the offending extensions and then re-enable them, their memory usage stays low, but then another 1-4 starts adding memory usage. Extensions downloaded from the opera page and those from the chrome page have the same problem. For one example, at this moment, type ahead find ( https://chrome.google.com/webstore/detail/type-ahead-find/cpecbmjeidppdiampimghndkikcmoadk?hl=en ) is using about 130,000 KB, but normally uses about 10,000-20,000 KB. Does anybody else have this problem and/or have a solution? Thanks in advance for any help you can give! No problems (despite we are not sharing any extension >_>). Yes....I can see that you do not have my problem. If anybody has an idea of how to deal with this, I would appreciate it. I am going to start turning off extensions one at a time and see if one of them is the cause. Of course, more than one usually has the problem at one time, so if one of them is causing the problem, it would have to also cause the problem with other extensions. I just want to add a key aspect: the same thing happens in chrome. Take a look at the extensions website/report issues and comments, maybe other users has reported the same behavior. You can try disabling the extensions that are sharing data in a server between Opera and Chrome (if any, (RoboForm maybe?)). With the same extensions or similar ones? If so then maybe those extensions are memory consuming ones. Thanks for responding. I use the same extensions in both browsers. This happens at one time or another with all but two of my 12-14 enabled extensions. All of those cannot be memory hogs. I think one of them is affecting others. I am in the process of turning them off one at a time, so we will see. Are they being kept updated? Maybe something has changed that is causing the issue and the authors may need to address it, don't know. Did you ever tried with a clean profile folder? They are updated regularly and all are current. I will try the clean folder idea and report back (may be a day or two). I really appreciate your help!